Last year, we held a position in a broad market ETF that represented a global cross-section of country stocks. Earlier this year we sold this position, given the global volatility that had begun to shake developed (and emerging) markets. We’re exclusively focused on North America of late, although that may change in a few months. Sometimes I see a Portfolio Manager on BNN espouse Europe as a great place to invest – typically they endorse an ETF representing Europe. I don’t agree that now is a good time to buy into Europe. Today’s blog shows why I hold that view. Above is the chart of the iShares Europe ETF, which represents a broad cross section of country ETF’s. You can see on the chart that the broad European market is consolidating in a right angled triangle. Support at $44.50 needs to hold in order for the bulls to hold out for further upside. As a new investor, I would only buy upon a breakout of the triangle, through about $47. Note the declining moneyflow momentum (top pane) and decline momentum studies. However, longer termed cumulative moneyflow (bottom pane) remains bullish. The IEV ETF weights UK, France, Germany and Switzerland as its largest positions. They represent 72% of this ETF’s weighting. So it’s important that they hold out. Upon examining them I note that individual ETF’s for the UK, France and Germany look pretty much identical to the bigger picture IEV European ETF. That is, they are consolidating within a right angled triangle. I’ve posted the chart for France (EWQ) below. Switzerland is the only member of the 4 largest positions that appears to be breaking the consolidation pattern. Chart is below for the EWL ETF. Note the break below support and the proceeding waterfall decline. Many of the smaller components of the broad IEV ETF are breaking down. I probably don’t need to tell you that Italy is in trouble, But so is Sweden. Note the declining trend on EWD. The big picture looks “OK”, but not great for Europe. While most of the major components are holding support within the European individual country indices, many are not . Personally, I’d look elsewhere before buying into Europe at this time. 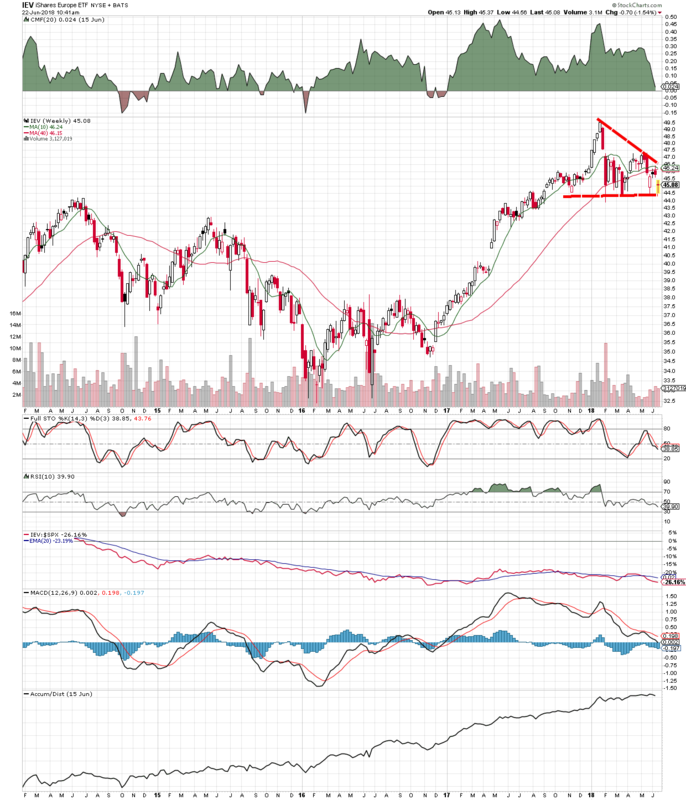 A bullish breakout through the triangle, noted above, would change my opinion – but that day isn’t here yet. NONE OF THESE CHARTS OFFERS BULLISH FEATURES ON WEEKLY CLOSING: NEGATIVE PMO CONFIGURATION, RSI UNDER 50 AND S.C.T.R. (STOCK CHART TRADING RATE) UNDER 25%. ON TOP OF THAT, THE 17 WEEK E.M.A. IS CLOSING IN NEGATIVELY WITH THE 43 WEEK E.M.A. FOR A SELL SIGNAL. (IT IS ALREADY THERE WITH EWD AND EWL). BY THE WAY IT IS NOT ANY BETTER WITH EMERGING MARKETS (EEM AND EFA). TARIFFS, TARIFFS! $NYA (NYSE STOCK COMPOSITE INDEX) IS RIPE FOR A BOUNCE AT 250 DAY E.M.A. SLOW STOCHASTIC NOT HOOKING YET OVER THE 20 LINE (%K (5),%D(1), DAILY CHART).